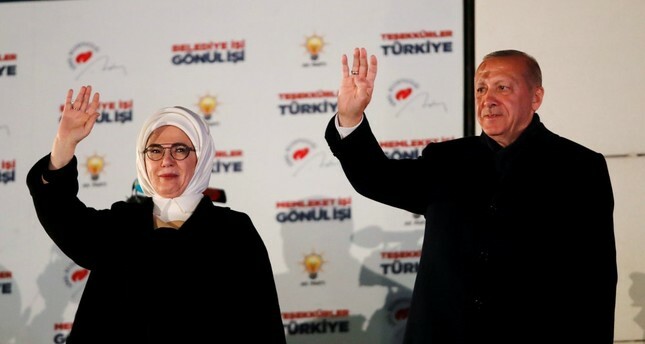 President Recep Tayyip Erdoğan and first lady Emine Erdoğan greet Justice and Development (AK Party) supporters during the president's traditional balcony address in Ankara, April 1, 2019. Now that the March 31 municipal elections have been left behind, the government and the private sector plan to focus on implementing expansive economic reforms. In his first statement on election night, President Recep Tayyip Erdoğan drew attention to the four-and-a-half-year period in which no elections will be held. Erdoğan said his ruling Justice and Development Party (AK Party) and government will seize as a period of miscellaneous reforms to ensure sustainable and healthy growth and fair distribution of wealth during this time. In both his speeches in Istanbul and Ankara, Erdoğan stressed that the government will ramp up efforts to swiftly accomplish much-needed structural reforms. "We have a very important reform program on our agenda. Turkey will implement a strong economic program without any compromise from free market rules," he said during his address to citizens in Istanbul. Also in his balcony address in the Turkish capital Ankara, Erdoğan reiterated the government's commitment to a far-reaching reform package. "All issues that require resolution will be attended to and settled with a reformist approach," the president said. "We have obstructed the attacks against our economy, and the reforms will enable us to build an economic structure more resistant to such attacks," he continued. During the four and half years heading toward 2023, the primary goal is to fortify the economy, sustain a growth performance based on technology and export and increase employment, the president highlighted. On April 8, the government will launch a comprehensive new reform package geared toward improving the country's economic outlook, according to an announcement made by Treasury and Finance Minister Berat Albayrak last week. The economy administration, led by Albayrak, has been working on a reform package for some time now. It includes significant changes in the tax regime, financial structure, agricultural policies and capital markets. The new economic road map that the new reform package will lay out stipulates a fairer and more inclusive tax regime, reducing indirect taxes. The transition to a registered economy will be expedited with the measures included in the new road map, while the financial structure will be redesigned. With the goal of expanding capital markets, the reforms will include steps to establish a new fund, regulations to boost Istanbul's ranking as an international financial center and the diversification of financial derivatives. Moreover, plans to reduce unemployment and ensure a fairer distribution of income will be implemented. Production plans in agriculture will be included in the program, while the incentive system will be redesigned. Some analysts also expect that the wide range of reforms will also expand into the legal sphere. In September 2018, Albayrak also announced the New Economic Program (NEP) that outlined a broad guideline for the economic rebalancing period. The program shared forecasts for growth, inflation, unemployment and the current account deficit, while suggesting principles to manage these macroeconomic indicators. In 2018, the Turkish economy registered 2.6 percent growth despite turbulent times while shrinking by 3 percent in the last quarter of the year. In a note shared with the clients, British bank Standard Chartered stressed that the commitment to tight fiscal and monetary policy is important for Turkey's economic and funding outlook. "These were the key elements that allowed for Turkey's emergence from its 2018 foreign currency fluctuations. The bank noted three significant areas to watch in the post-election period. The first is the inflation data, which will be announced on Wednesday. The second is the unemployment rate, which came in at 11 percent last year, and the central government release on April 15. The members of the Turkish business world also stressed the urgency of focusing on economic reforms and sustaining healthy growth in the non-election period leading up to 2023. The upcoming no-election period following local polls in Turkey is an opportunity for the country for economic, social and political reforms, Turkish Industry and Business Association (TÜSİAD) said on Sunday. "Tighter monetary and fiscal policies prescribed in the New Economic Program introduced by the government on Sept. 20, 2018 should be prioritized for building economic confidence," the statement by the organization read. TÜSİAD expressed hope for rapid implementation of structural reforms, beginning with the investment climate, education, digital transformation and labor market after the March 31 local polls. "During this new reform period, our primary objective should be to produce lasting solutions for our economic problems," the association said and added, "Only a comprehensive economic approach that adheres to free market principles, strengthens the independence and transparency of regulatory agencies, commits to structural reforms that increase competitiveness and diminishes economic weaknesses can be effective." The business body said the rule of law, freedoms, independent institutions and a free market economy are fundamental to this comprehensive economic approach. Ankara Chamber of Commerce (ATO) Chairman Gürsel Baran said the economy should be focused on after local elections, adding, "We have a four and a half year no-election period in front of us. In this period, let's complete the structural reforms that will provide added value production in our economy." The economy should top the agenda in order to bring Turkey among the world's 10 largest economies, according to the ATO chairman. "The Turkish economy should be transformed into an economy capable of carrying out high value added production and an economy that makes high exports. In this period, which is witnessing a rapid change around the world, we need to implement all the reforms needed for us to also capture this changing trend. Basic balances of the Turkish economy are strong enough. Let's bring Turkey to the position it deserves in the global league, let's work more for more production, investment, employment and exports," said Baran. On the other hand, Aegean Exporters Union Coordinator Chairman Jak Eskinazi also pointed to the importance of focusing on the economy hereafter. He also noted that Turkey has entered a four and a half year period without elections ahead, suggesting that for the country to reach its 2023 goals, real policies should be followed and the time should be evaluated well. "As exporters, for Turkey to reach 2023 goals, we will focus on production and exports based on innovation, R&D [research and development], and design… We should focus on reforms that will strengthen Turkey's position in the global competition as of today," said Eskinazi. "Elections are now left behind. We are entering a four and a half year no-election period. Hereafter, economy should be the first issue on the agenda. We must turn this period into a period of uninterrupted performance," according to head of the Union of Chambers and Commodity Exchanges of Turkey (TOBB). Rifat Hisarcıklıoğlu said there are a lot of steps and a lot of work to be done in the economy. "This period, during which we will be able to focus on economy, therefore implement structural reforms that will further strengthen foundation of the economy one by one, is of high importance for our country," said Hisarcıklıoğlu.